High Pressure Suspension Grinding Mill is a new kind of grinding mill, which is invented by our company chief engineer Mr Bai yinghui, who has been engaged in the research and development of grinding mill for many years. This new patent product with high efficiency and low energy consumption opened up an epoch of the international industry pulverizing. 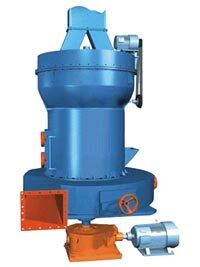 High Pressure Suspension Grinding Mill is mainly applied to the powder processing of mineral products in industries of metallurgy, construction, chemistry, and mining etc. The grinding mill can produce powder from more than 280 kinds of non-flammable and non-explosive mineral materials with Mohs hardness below 9.3 and humidity below 6%, such as barite, limestone, calcite, granite, porcelain clay, basalt, gypsum etc. 1. Compared with the common raymond grinding mill under the same power conditions, the capacity can be increased by 10%; moreover, under the performance of high-pressure springs, the rollers grinding pressure on raw materials can be raised by 800-1200kgf. 2. The final product size ranges from the maximum particle diameter of 0.613mm (30mesh) to the finest diameter of 0.033mm (425 mesh). 3. All the mineral materials with Mohs hardness below 9.3 can be crushed. 4. The grinding device adopts a superposition multi-grade sealing with good sealing performance. 5. Its dust-removing effect fully meets the national dust discharge standard. 6. The classifier is easy for adjustment. In the mainframe of High Pressure Suspension Grinding Mill, there are strong springs with pressure as high as1000-1500 kg equipped on the roller suspender. When the Grinding mill works, the roller rotates around the principal axis, and clings to ring under the effect of the strong spring and eccentricity. When the materials are sent into the grinding chamber, they are brought to the space between the roller and ring and get grinded. Then the powder grinded will be blown into separator. The fine powder after departed with the air is discharged through the outlet as final product. The large-sized powder falls back for regrinding. The air will be back to the blower for repetition of the above process. The left air will come to the bag filter to get cleaned. When the wear and tear between roller and the ring reaches certain degree, adjust the length of the strong spring, so to keep the invariable pressure between the roller and the ring, to make sure the stable production and the fineness.